In a 5- quart Dutch oven, heat 1 tbsp olive oil over medium heat; add beef and brown evenly. Add garlic and stir for one minute. Pour off drippings. Stir in black pepper, broth and dried thyme. Bring to a boil; reduce heat to low. Cover tightly and simmer 1 1/2 to 2 hours or until beef is tender. Meanwhile lightly spray 15 x 10 x 1 inch- pan with cooking spray. Place whole mushrooms, plum tomatoes and onion in pan. Combine 1 1/2 tbsp olive oil and 1 1/2 tbsp vinegar; drizzle over vegetables, tossing to coat. Roast 20 to 25 minutes or until tender. 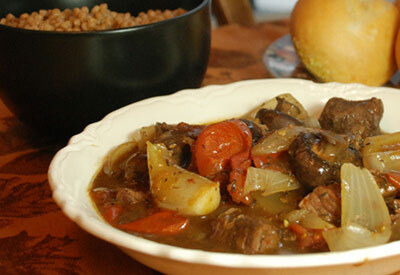 Bring beef stew to a boil over medium-high heat. Add cornstarch mixture; cook and stir 2 minutes or until sauce is slightly thickened and bubbly. Stir in roasted vegetables and remaining 2 teaspoons vinegar.